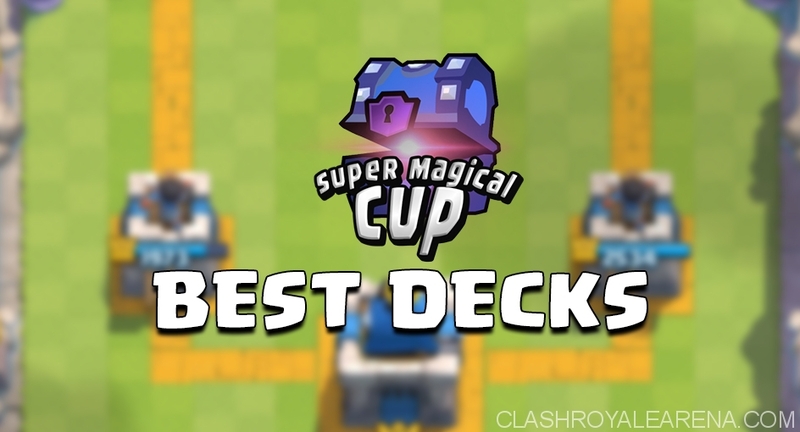 Hello guys, today I am going to share the best Clash Royale decks in the Super Magical Cup #9. There are 8 new fresh decks in total and I am pretty sure that you will definitely like them! Super Magical Cup is a weekly 128 player tournament where people bring 2 decks (4 different cards) and must win a bo3 (best-of-3) battle each round. For more information, you can visit the homepage of the Super Magical Cup at here. I will try to keep this page update every week as long as used decks are stunning and new! Note: You can watch the replays of top 4 players at here. Last week, Innerlol shown an extremely impressive performance in the Super Magical Cup #9 with 0 loss, 17 wins in a row, unstoppable! This is the first perfect performance in the history of Super Magical Cup! And he did that with just level 3 Balloon. Innerlol is a very aggressive Clash Royale player, you can easily see through the replays. His Giant Balloon deck was extremely deadly! This type of deck is dominating at Arena 8, punishing all players who like using low Elixir cost cards. It’s super hard to stop this 5000 HP push If you use cheap troops that can be easily killed by the Arrows. Once he smelled blood, he would play the Giant Balloon combo perfectly and the enemy would always be hopeless to stop it. The way he played is Mini Hog Deck was impressive. I really enjoyed watching the ways he used his Zap to get positive Elixir trades and launch a counter push right after that with survived troops, the way he rotated troops and did mircro Goblins/Cannon/Minion. Everything was perfect~! I think we all have already known Pompeyo, the first level 6 player in Legendary Arena. After the SMC #9, his Lava Hound Control deck is very popular among the top ranks now. He has an interesting trait of wanting to cycle the deck without using Skeletons or Cannon. His Lava Hound deck was played like a Golem Poison Deck, where you want to cycle everything to get those Collectors and launch a super big push at the last moment. Long time to see Hog Freeze huh? But, this time is a brand-new one! He successfully controlled the Elixir flow of both players by throwing Fireball to opponent’s Collectors while playing Collector himself. The opponent is usually forced to attack by these 2 good ways of dumping Elixir, and, got into the back hole of Ice Wizard’s defensive power. Goblins + Inferno Tower + Ice Wizard is a deadly combo that stopped lots of pushes, while the Elixir Collectors is piled up for Hog Rider + Freeze combo. Aydo made it to the Top 4 from Top 8 with a wonderful play with Mini P.E.K.K.A and Princess. These two-way cards and Elixir Collector finished the jobs extremely well and got ahead to the opponent’s Towers so many times. All in all, nothing really special to say here, but, he made it to top 3, he is the man! Woody made it to Top 4 the fourth time, continued the impressive of never losing in Top 8 round. Woody’s innovative playstyle is heavily based on pulling and stifling opponent’s pushes. Trust me, the way he plays his Mortar decks is totally unique. By using 2 different kinds of Mortar decks, Woody showed how far he could push the 4-card rule in Super Magical Cup. Rocket and Elixir Collector is a great creative trade-off. Most Elixir Collector decks don’t have decent ways to deal with opponent Elixir Collectors. With the Mortar Collector deck, we can easily use dirt cheap cards to cycle through the deck and stack Elixir Collectors. 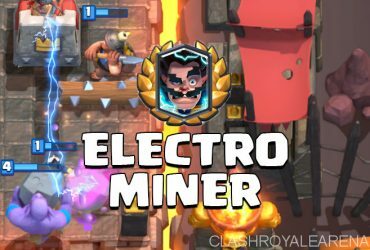 With the Mortar Rocket deck, destroy your opponent’s Elixir Collectors instead of joining the race. Sometimes, with the Rocket, you can easily stop 10 Elixir pushes. 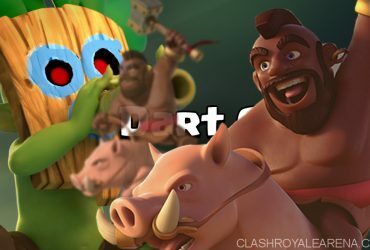 With the next Mortar buff, I strongly believe we are going to see his Mortar decks again in the upcoming big Tournaments! Decks in Super Magical Cup must be 4 cards apart and JUAN just took it home by maximizing the limitation. However, using Collectors and cheap defensive cards in both decks provided two totally different decks. These 2 decks make the most use of Poison, which are very common in Arena 8 and they are being used by top players a lot. Poison Spell makes your attacks a lot stronger as it’s pretty hard for your opponent to deal with your diverse push while getting slow, also, defending cards need to be a bit tanky to survive the Poison. This is definitely one of the best deadly spell cards in Clash Royale. It’s very nice to see people using this card a lot these days! Justin won the Super Magical Cup last week and he is a regular member of this tournament. As far as I know, he is a masterful defender. I saw he using a combo of Zap, Cannon and Ice Wizard to stop nearly any push in Clash Royale. He filled the rest of the spots in his decks with similar cards. Basically, these 2 decks work in the same way. This type of deck is the midway point between the hyper-aggrressive Hog Rider Cycle Deck and the defensive Trifecta Deck. This deck leans on the Ice Wizard a lot! I haven’t seen any deck like this before. Clyde bought a new stunning Clash Royale deck type into the tournament! Both decks use Elixir Collector, Minions, Barbarians and Zap to defend. These defensive cards are all great for resource generation. The Lava Hound deck has one pretty expensive card and some cheap ones, the Giant deck is somehow more balanced. This makes the Lava Hound deck get 2 Elixir Collector faster as there are lots of cheap ways to use 4 cheap cards. Meanwhile, the Giant deck has more power by making the most of two-way cards and using the Skeletons to cycle it with a cheap cost. In the last tournament, Clyde paved through top killers row (Raintown, Yarn from Orange Juice and Nickatnyte) before losing to Justin!2$, that was very impressive. I love watching his games and enjoying his playstyle. Maciawa is the only one in the Top 8 who won a game against Juan’s Golem Poison Deck, the winner of #8 Cup. Maciawa was keeping Juan under a lot of pressure making Golem was never event played. While other Hog Rider players usually like using Cannon in both Decks, Maciawa used the Inferno Tower in one deck. IMO this is a good option in order to deal with players who use 2 Royal Giant decks. Want to build your own Clash Royale deck? Please take a look at our Clash Royale Deck Building Guide! Shared by The Rum Ham.